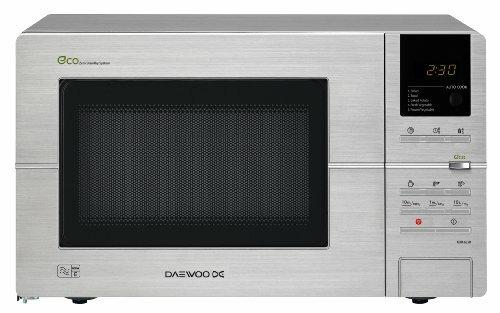 The Daewoo KOR6L5R is a stainless steel solo microwave, featuring a 20 litre capacity and 800w power output. Looks great, reasonably priced Buttons aren't that well labelled. The Daewoo KOR6L5R features an expensive looking brushed stainless steel outer - which looks far more expensive than the relatively low price tag suggests. This brushed finish will continue to look smart, as unlike glossy models, it shouldn't show any finger prints. Currently retailing at around the £65 mark, this solo microwave from Daewoo features a 20 litre capacity and 800w power output - fairly standard for silver microwave ovens in this price bracket. Overall it includes 10 different power levels, as well as a zero standby energy consumption mode is save power when not in use. Despite it's relatively small dimensions - 44.6cm by 70cm by 33.2cm - it still features a 24.5cm turntable, which should accommodate most dinner plates. The one criticism we have of this Daewoo microwave is that the buttons are labelled mainly with symbols rather than text - and so at first it can be a little tricky to work out which button controls which function. Asides from that issue, it's a well designed microwave at a pretty reasonable price. 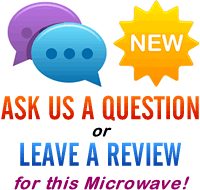 A well designed and smart looking solo microwave. Works well, and will suit any modern kitchen.